The ubiquitous Log Mountain House! 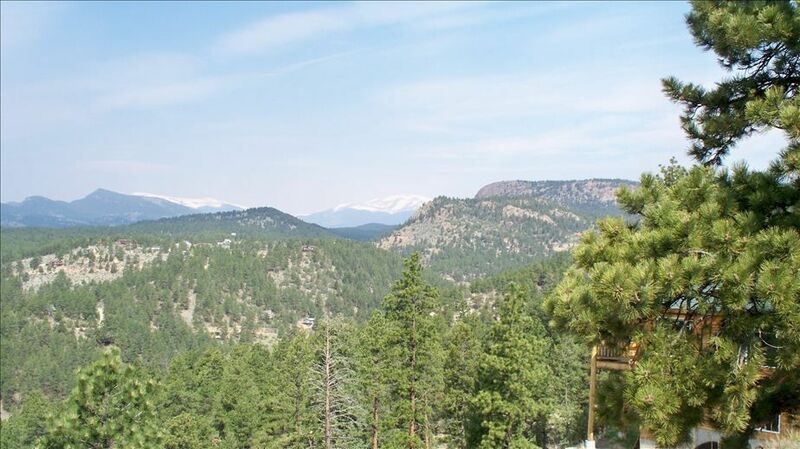 End of road location for great privacy and tremendous mountain and sunset views. Located in the 'Banana belt' so seldom snowed in, but 4WD suggested for icy conditions. We love staying here because it is so relaxing..... no need to leave! Old Copper mining area, hike to an old mine and old miners log cabins just minutes from the back deck. Main level has large Master Suite; and the Main living-dining areas-kitchen... all one big open room. Downstairs are 2 Mountain themed Bedrooms, bath with heated floor, laundry and Den with theater seating, surround sound and wood stove. WE love watching the foxes, birds and Mule deer. Black Bears too, don't leave any trash out, or you will have a BIG mess to clean up and you create a potentially dangerous situation... Good news is they don't come around very often. I am a Realtor & was my realtors worst nightmare! Not really - they're our best friends now - but we did look at over 125 houses before we found this one ! Crazy! We actually had another house under-contract, but when this one popped up as a new listing, we grabbed it instead. So glad we did, we love it more than we imagined we would. We had several parameters in finding a mountain home: Within 1 hour of Denver airport (takes one hr exactly), Elevation under 8500' (it is right at 8500'), open floor plan, has that ubiquitous mountain feel, has a place for the kids to hang out downstairs and most importantly A TREMENDOUS MOUNTAIN VIEW (boy, does it ever! breathtaking). Also this is in the 'banana belt' which means the snow melts really fast and you're rarely snowed in. We are only 2 1/2 miles off of US 285 but feels like we are on the edge of nowhere! Views out every window. 2 -story, big awesome decks. We have several favorite eating places that we love going to, especially Aspen Cellars. Even the Safeway store is a treat: Mood lighting, Mood music, a sushi bar, really nice ! you can use our code at check-out for more discounts. toilet, combination tub/shower, double vanity, fast hot water! Wow, tremendous sunsets and awesome trees and mountains and snow caps. You feel like your the only one here because of the wide vista views. There is a foosball table and ping pong table in the garage and horse shoes on the ledge so the kids can use up some their energy! Great view from the couch!!!! double balcony, one up one down. Big and nice! 3 Flat screens: Master, Den, Living Rm, 2 Large balcony's with vista mountain views plus equal awesome views from the couch ! You dont even have to go outside (but you must!). Many public mountain areas nearby for hiking, camping, outdoor fun. Lakeside golf course about 1/2 hr away. Snowboard park on Mt. Evans about 1 hr away. Only about 1/2 hr to Denver too.